Renua Ireland compared Dublin during the Luas works to Alcatraz in a statement today. RENUA IRELAND ISSUED a press release today comparing the Luas works currently taking place across Dublin to a “war-zone” which makes the city “harder to escape from than Alcatraz”. The party, which has no TDs in Dáil Éireann, and its leader John Leahy urge Minister for Transport Shane Ross to “sort out the ongoing Luas works that have turned life into pure purgatory for long distance country commuters”. [O'Connell Street] looks like it did after being shelled in 1916 such is the scale of the devastation. Speaking to TheJournal.ie, chairperson of the Dublin City Council transport committee Councillor Ciarán Cuffe dismissed the comparison between Dublin’s main street now and 1916. Leahy said that people face “four-hour commutes” as they spend their lives stuck in “city centre bottlenecks”. The Renua leader also extended his sympathy to business owners “who have suffered as a consequence of seeing their streets being turned into war-zones”. He compared the overhead lines from which the Luas operates to a “spider’s web” and added that the centre of Dublin has turned into a “jungle of wires, craters and potholes”. Renua closes its release with a call for Minister Ross to set up a task force with a remit to ensure that the Luas Cross City works is finished within three months. Green Party Councillor Cuffe said that people are well aware that the construction project makes getting around more difficult, but hundreds of thousands of people would benefit and avail of the service upon completion. I would be very cautious about comparing O’Connell Street now to how it looked after the shelling in 1916. One sticking point for Cuffe, however, is the issue of the overhead wires at certain points. One group of commuters who say the Luas works have had a negative effect is cyclists. They have raised numerous issues with the Luas Cross City works, with a series of complaints made to the transport authority on the issue. The complaints, released to TheJournal.ie under the Freedom of Information Act by Transport Infrastructure Ireland, detail some of the issues raised by members of the public in the last three months, with the word “lethal” used on more than one occasion. Currently, Luas Cross City is installing a track link between the Red and Green routes, together with the tram service’s expansion towards Broombridge in Cabra on Dublin’s northside. 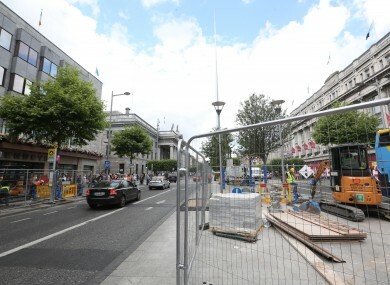 Most of the issues concern the works seen between O’Connell Bridge and Parnell Square in the city centre. Cycling alongside in-service Luas tracks can be hazardous as one or both wheels can easily become trapped in the rails’ grooves. After four years of construction, this Luas Cross City project is nearing completion. Expected to open in December, the finished project will add an extra line and 13 new stops onto the Luas network. Once it is complete, you won’t have to change trams if travelling from Brides Glen to Broombridge – meaning the green line tram won’t stop at Stephen’s Green (currently the most northern stop on the green line) and will continue on to Broombridge. Construction work is ongoing with latest road disruptions to affect Dawson Street, Anne Street South, Duke Street and Duke Lane for the next two months. Construction on the Luas Cross City began in June 2013. The cost of the project is estimated at €368 million. Email “Renua are claiming Luas works make O'Connell St 'look like 1916'”. Feedback on “Renua are claiming Luas works make O'Connell St 'look like 1916'”.